Arrival Denver International Airport for two nights’ stay in Denver. Direct rail service connects DEN to downtown’s Denver Union Station. Experience the walkable Lower Downtown (LoDo), Larimer Square, Denver Union Station and the 16th Street Mall free shuttle bus. Or, take a B-cycle from the citywide bike-sharing program to visit the unique, urban neighborhoods like the Highlands or River North Art District. Sample craft beer and farm-to-table cuisine throughout the city at chef-owned restaurants, rooftop bars, outdoor cafés and breweries and use the Denver Beer Trail guide to check out 20 of the city’s unique craft brews. Learn about the Wild West through arts and culture from the giant Blue Bear to the American Indian and Western art collections at Denver Art Museum, Denver is filled with creative experiences for all ages. 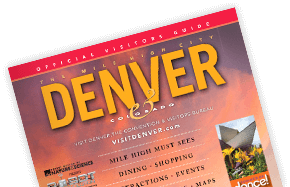 Shop till you drop in downtown Denver at Denver Pavilions and Larimer Square or head to Cherry Creek where you will find Macy’s, Nordstrom, Neiman Marcus and hundreds of shops, boutiques, restaurants and spas. Explore Denver’s Western history at the History Colorado Center and take a piece of that rich history home from the family owned Rockmount Ranch Wear store in the heart of the city, where the first snap button cowboy shirt was invented. See live music under the stars at Red Rocks Park & Amphitheatre, where the stage is as captivating as the music itself. During the day, Red Rocks is a free city park with easy hiking trails and a visitor center that includes a Performers&apos; Hall of Fame. Garden of the Gods is an otherworldly landscape of red sandstone outcroppings. Estes Park, Colorado/Rocky Mountain National Park/Trail Ridge Road-the highest continuous paved roadway in North America/Overnight in Grand Lake, Colorado.